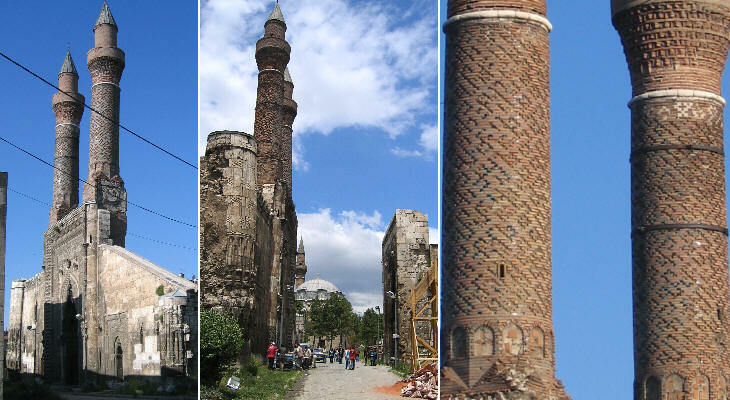 The third great medrese built in 1271 was located opposite Sifahiye Medrese (see page one) as if to show that the new Mongol rulers were willing to provide Sivas with monuments comparable with those built in the past. Cifte means twin and no doubt the two imposing minarets are the main feature of this medrese, the interior of which is lost. 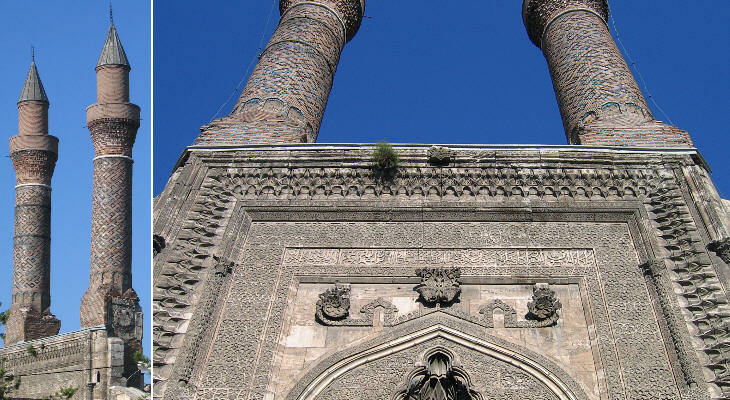 Unlike Gok Medrese the minarets are built above the portal and not at its sides and they are not fluted. The decoration of the portal is characterized by some projecting reliefs and in general by a decoration which is not as flat as in other portals. This may be due to the fact that there is very little space between this medrese and the opposite one and therefore the view is from a very angled position; in this situation high reliefs are more visible. Sivas is located at an altitude of 3,800 ft: the vegetation of the nearby region is all but luxuriant, while the decoration of Cifte Minare Medrese has a richness of plant motifs which is typical of a tropical country. This can be observed to a greater extent in the monuments of Divrigi. Towards the end of the XIVth century Sivas became an Ottoman possession. This condition lasted for just a few years because in 1402 Timur defeated Sultan Bayezid and the Ottomans lost Sivas and other eastern provinces. A century later they were re-conquered by Sultan Selim I (1515-20). Mehmet Pacha Camii is a fine Ottoman mosque; it is known also as Kale Camii, which means mosque of the castle/fortress, although the building is at a certain distance from the site of the old fortress (today a public garden with very limited evidence of its ancient use). Sometimes the beauty of a town depends on the prevailing stone used to build its monuments. 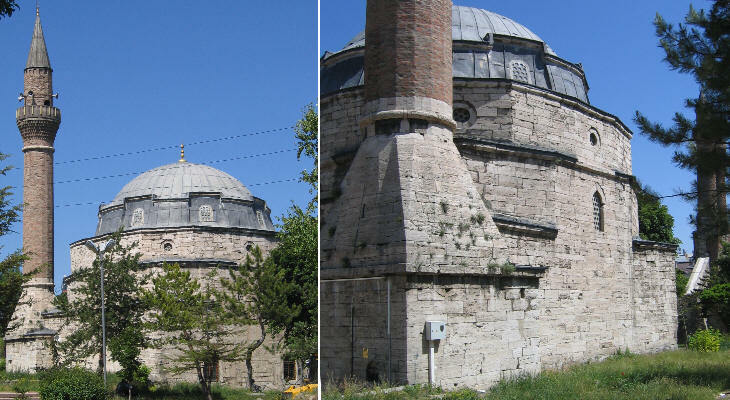 An almost white stone characterizes many buildings of Sivas and enhances their design. This caravanserai dates from the Ottoman period; however its decoration and in particular the reliefs portraying lions were taken from a Seljuk building. Almost all caravanserais located in Turkish towns have been turned into markets dedicated to a specific range of goods. Today Subasi Han is the spice market of Sivas. The image used as background for this page shows a detail of Gok Medrese.